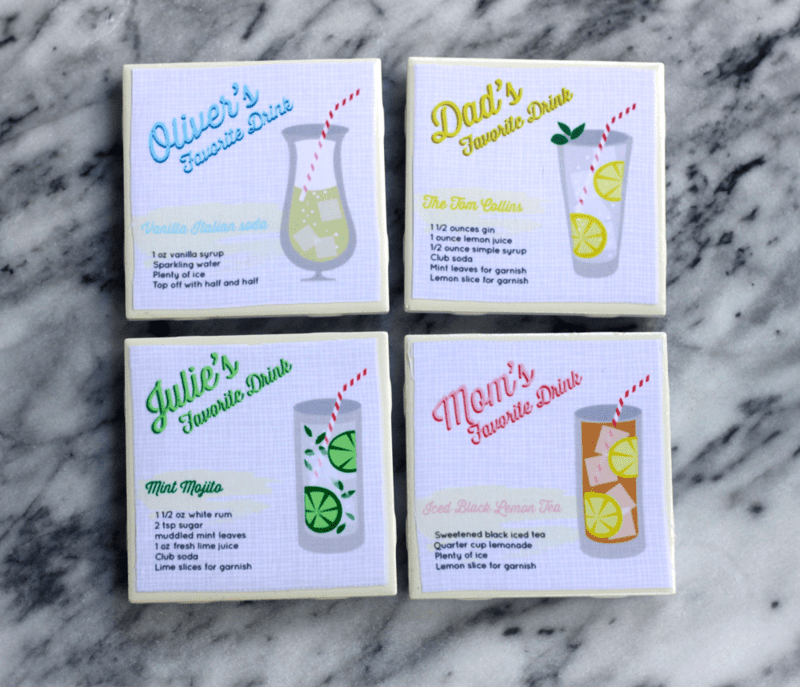 I used Adobe Illustrator to create my four different coaster designs. I started out by creating a new art-board with dimensions 8″ x 8″ (same size as a Spoonflower swatch of fabric), at 150 DPI and in the RGB color mode. 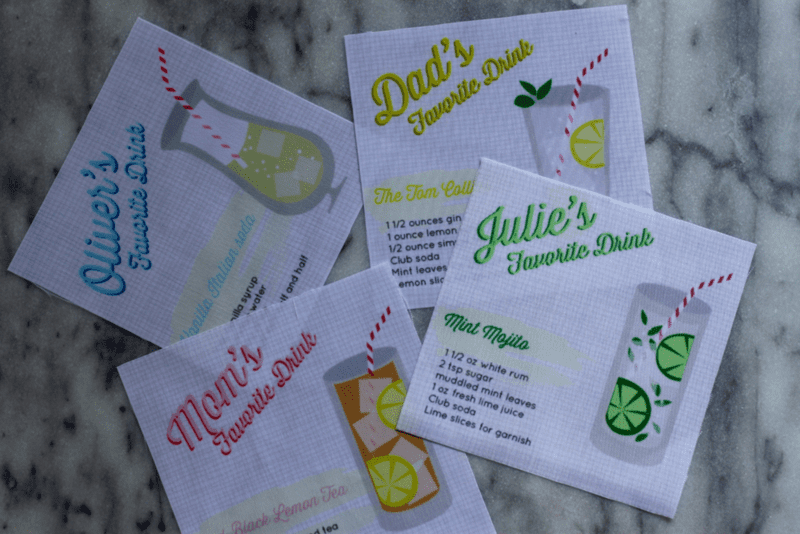 You can use any digital design program you like to make these. Here is a list of free or nearly free programs including several that work in vectors similar to Illustrator. All your program really needs to be able to do is create text and save as an 8″ square at the mentioned specifications (JPEG or PNG, 150 DPI, RGB). 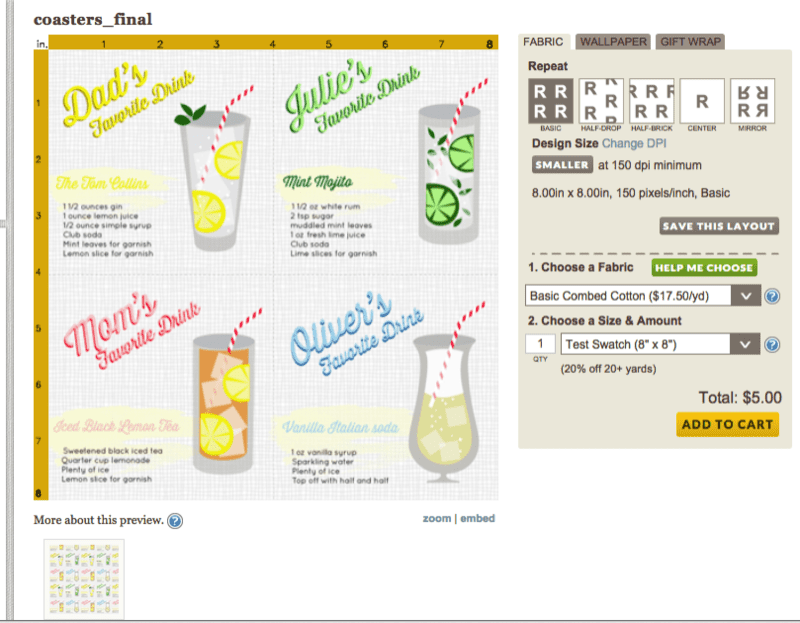 Learn more about what types of files you can upload to Spoonflower here. Once my art-board was set up at the correct dimensions, I placed a faint gray dotted stroke down the center vertically and horizontally to divide the space into 4 equal parts, one for each coaster. 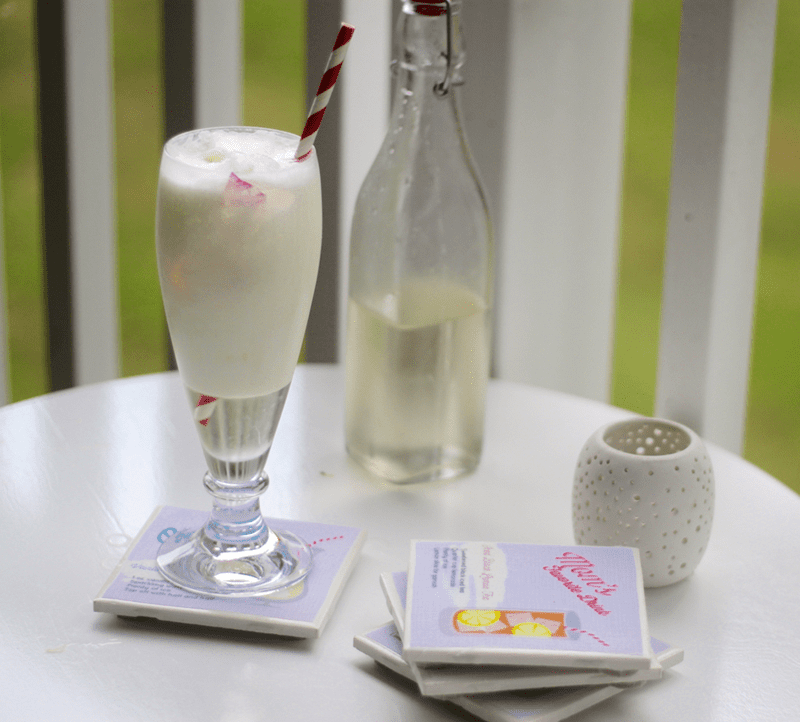 Then, just start filling in each coaster with your drink recipes! 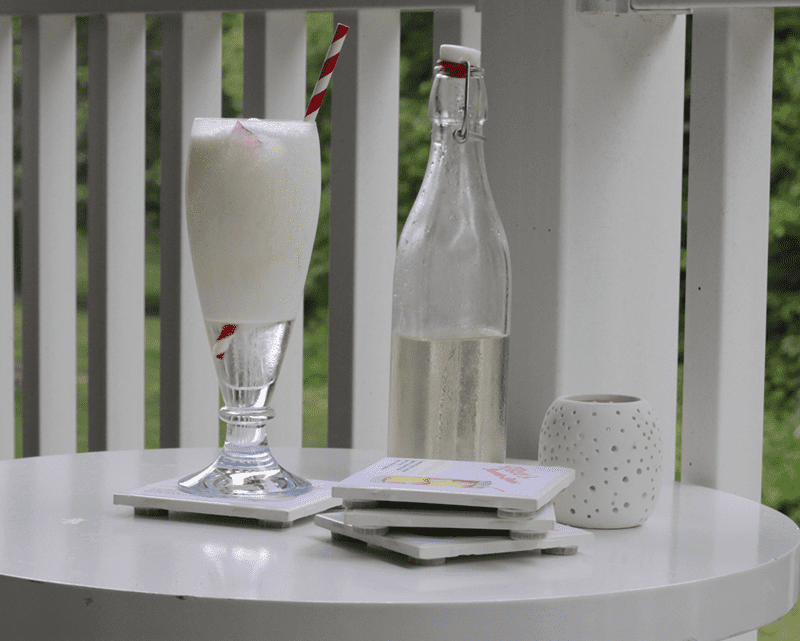 You can design this as minimalist or as embellished as you want, just make it your own and try to create something that reflects the drink recipe you’re putting onto it. 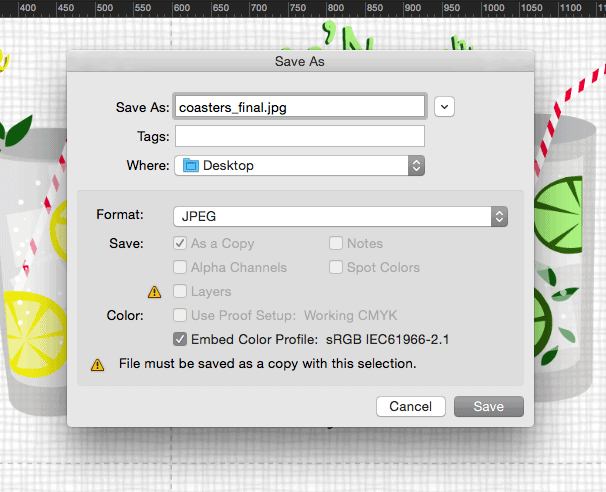 Once you’re done designing, save your file as a JPEG or PNG and save it to your hard drive. 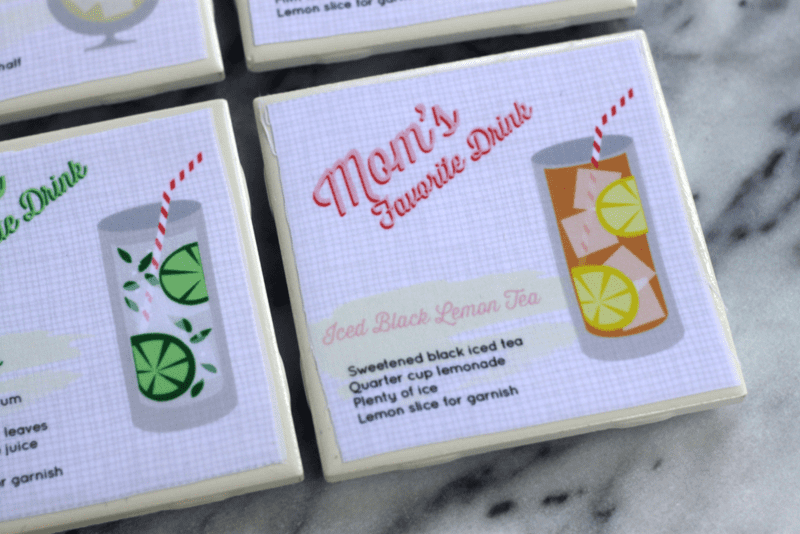 Log into your Spoonflower account and upload your design by selecting “Design” > “Upload.” Choose “test swatch” as your size, depending on how many coasters you want to print. 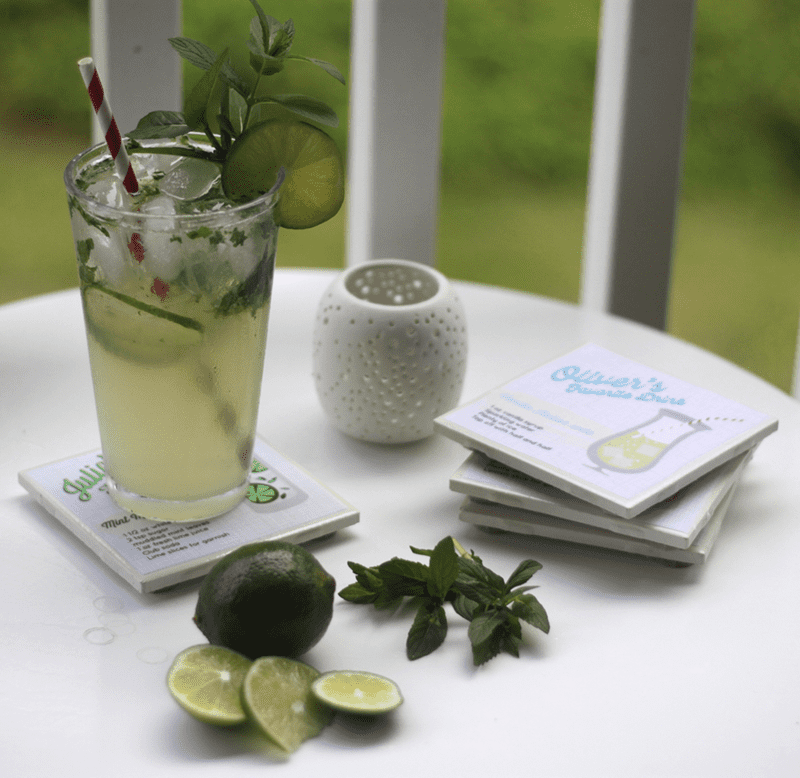 The four coasters should fill up the swatch size perfectly, but if you want to print more than that, just select a “fat quarter” or “yard” and make sure “basic repeat” layout is selected. 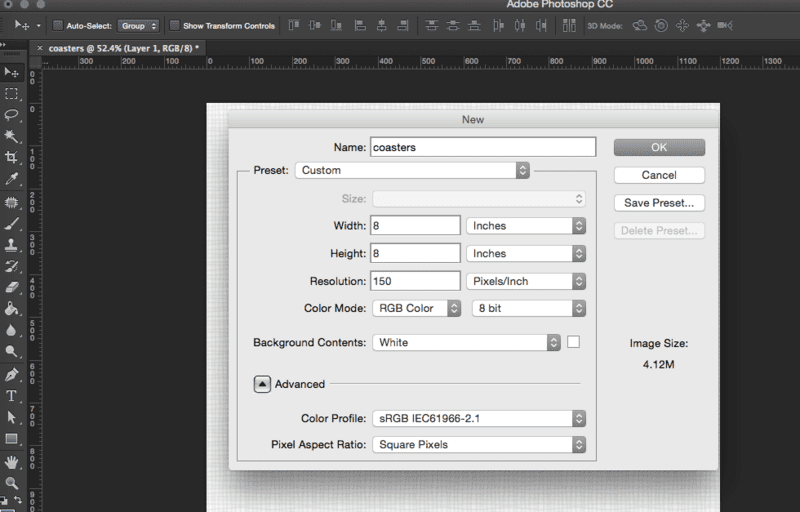 The preview will adjust to reflect what the fabric will look with your design once printed. Any fabric will work pretty well, but I am going with Silky Faille since it prints so vividly, has a nice medium weight, and it’s polyester which means it’ll wrinkle less while I’m working with it. 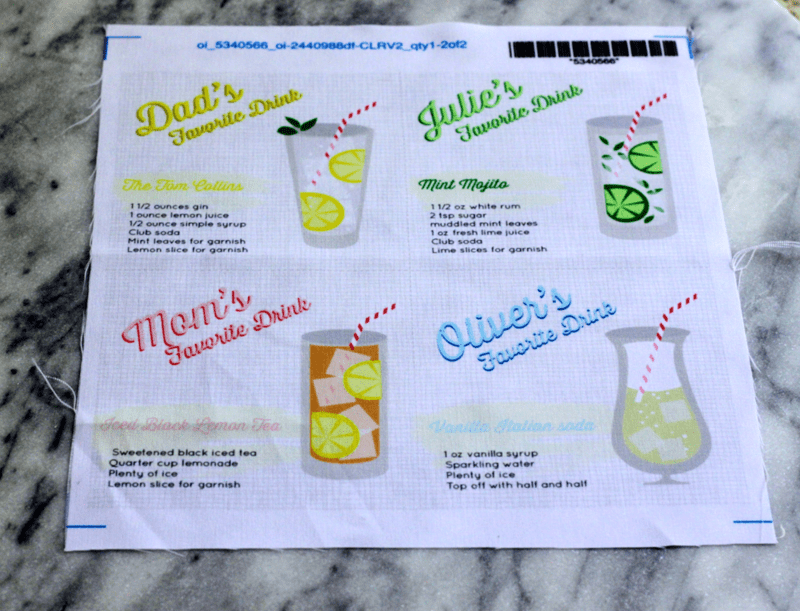 Here’s the printed swatch! It turned out great. 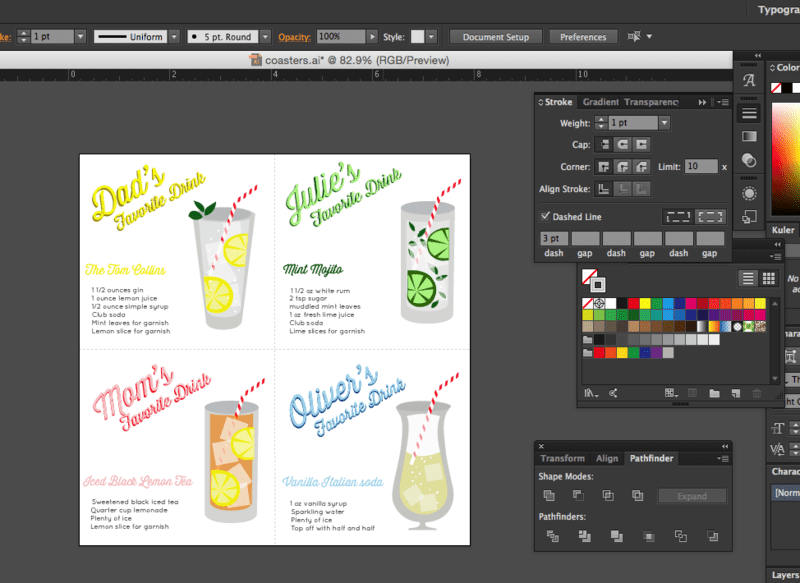 I probably should have given the yellow “Tom Collins” drink recipe title a little more contrast to make it more easily readable, but that’s okay. As long as we can read the ingredients clearly we’re good! 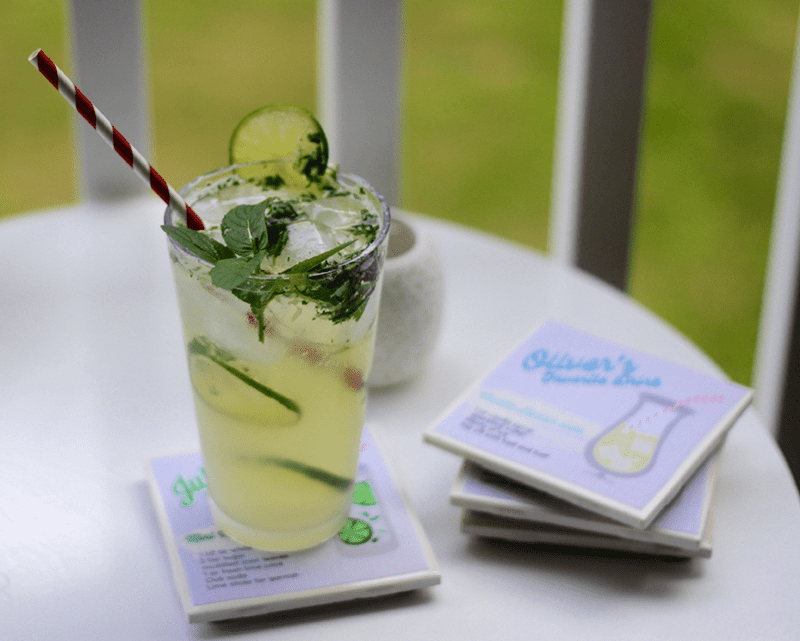 Now that we have our printed swatch, we’re ready to gather up the rest of our materials and make these babies into coasters. 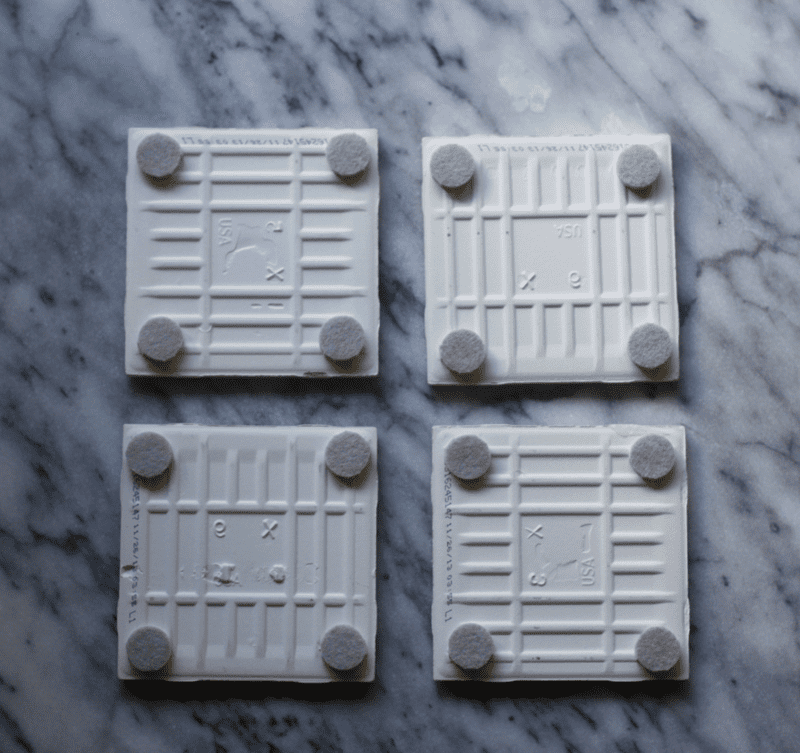 -Four 4″ square tiles. I found these at my local Lowe’s Home Improvement store for about 65 cents a piece. You’ll find tiles like this in the Flooring section of most hardware and home improvement stores, and they’re remarkably cheap! Cut out your coaster squares along the dotted lines in the center, and along the outer borders. Peel off the backing from the adhesive felt pads, and stick them onto the bottoms of your ceramic tiles. I think my whole world got a little bit brighter when I first discovered Mod Podge. 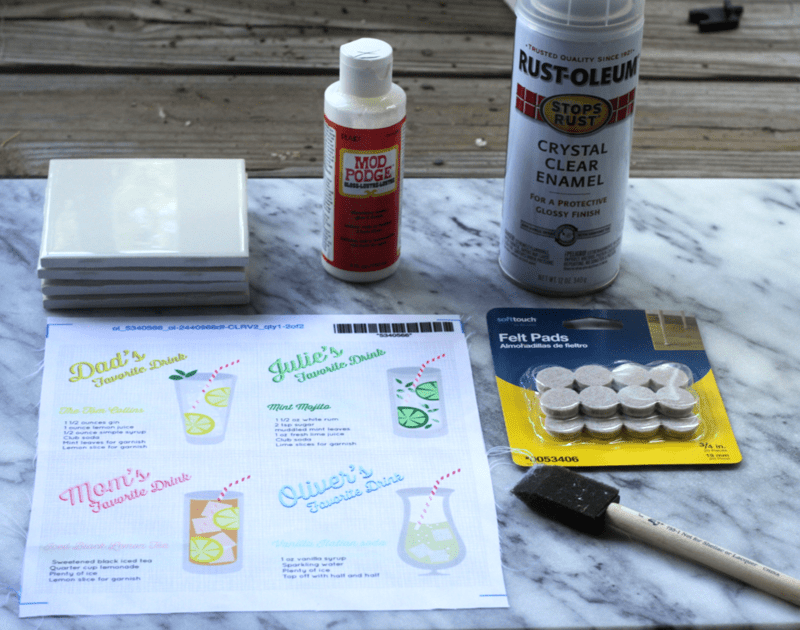 If you just ran out of your bottle or you want to take your crafting to the next level, here’s a great recipe I found for homemade Mod Podge that you could also use. 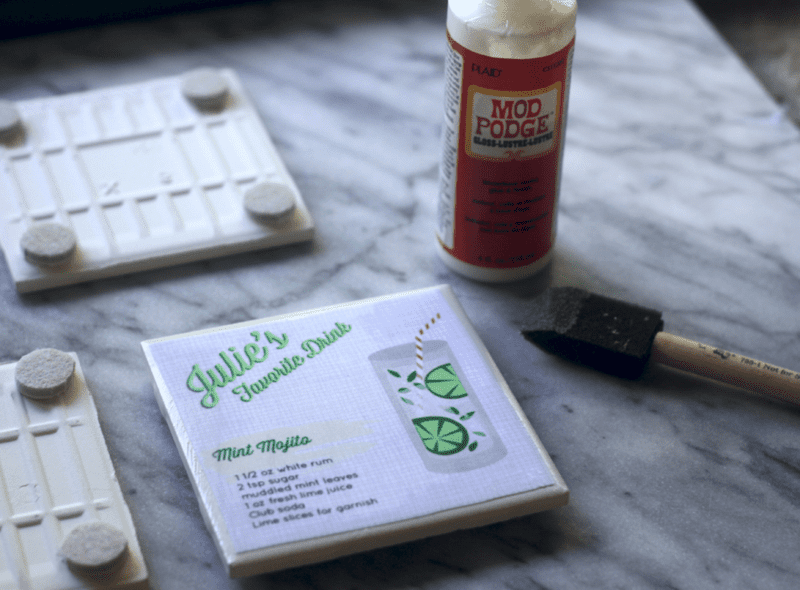 Using your sponge brush, paint a thin layer of Mod Podge onto your ceramic tiles, and onto the back of your fabric. 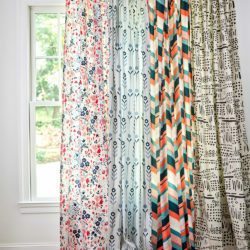 Stick your fabric onto the tiles, then go over the fabric again with another thin, even layer of Mod Podge. Place the freshly Mod Podged tiles in a cool, low humidity spot to dry completely for about one hour. 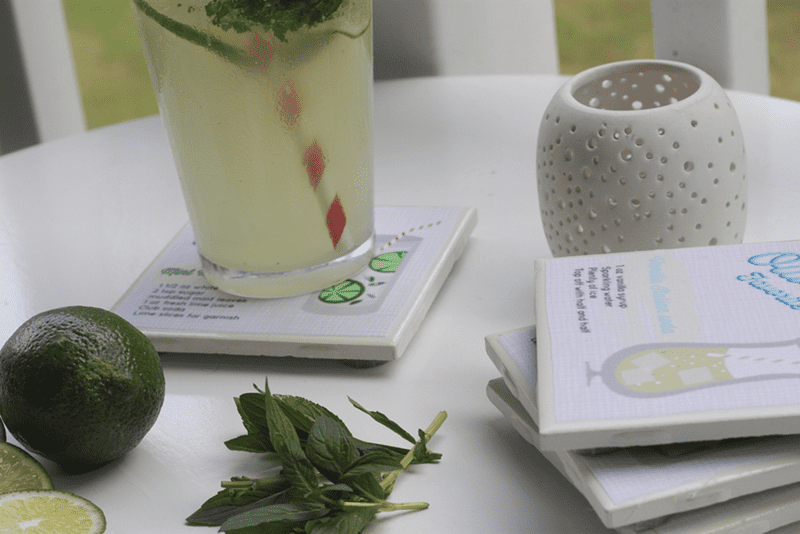 Once dried, you can spray them with the clear coat glaze to create sealed, moisture proofed coasters. Love your idea! So many possibilities. Glad you enjoyed it, Patty! 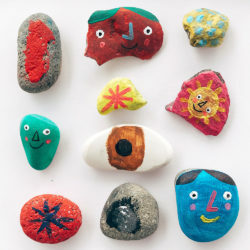 We’d love to see yours if you decide to make them! Looks like a lot of work, but they look great! Any chance they absorb the moisture? 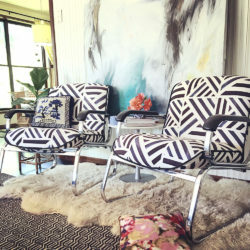 As long as you apply the Mod Podge correctly, they shouldn’t! 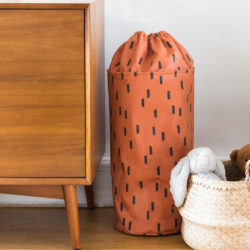 The Mod Podge creates a moisture barrier. Can these be used for hot beverages too?